A corrective deed is an instrument used to correct a small error in a deed that has been recorded at an earlier date. Corrections can only be made to non-material errors, causing no actual change in the substance of the deed. Common mistakes include typographical errors, accidentally omitted suffixes or middle initials, misspelled street names, etc. Major, or material, changes to the substance of the deed have a legal effect in how property is titled, and therefore require a new deed. Adding or removing a grantee, for example, or making significant changes to the legal description, may all require a new deed of conveyance. When in doubt about the gravity of an error and whether a correction deed is the appropriate vehicle to address it, consult with a lawyer. For the corrective deed to be valid, all parties who signed the prior deed must sign the corrective deed in the presence of a notarial official. If the grantor is married, Alaska requires that both spouses sign the deed (AS 34.15.010). Finally, the deed form should meet all state and local standards for recorded documents. Submit the completed corrective deed, along with any necessary supporting materials, to the local recording office for entry into the public records. This article is provided for informational purposes only and is not a substitute for legal advice. 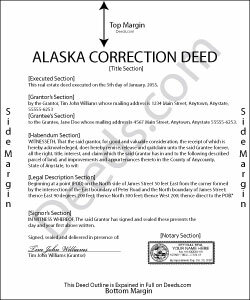 Contact an attorney with questions about corrective deeds or any other issues related to real property in Alaska. Judy C. said: Both sets of deeds were complete and easy to understand. Both states accepted the forms to transfer property. Pamela W. said: This was so easy! Doing it this way saved me a bundle. I used the example form to make sure mine was correct. I would highly recommend this to anyone. Reply from Staff: Thanks Pamela. We're glad the completed example was helpful.